Go behind the scenes and operate a top-secret safe house in the midst of a shadowy conflict. Due to your exemplary work in the field, you're being promoted to Chief Officer of the Kazitaire City Safe House. The communist plague has infected this nation, and it will be up to you to liberate it with the swift kick from the boot of American freedom. It's time to get to work." One part tycoon game, one part puzzler, and another part espionage simulator, Safe House is if "Papers, Please", "Sim Tower", and "James Bond" had a baby. - Deep simulation of running, constructing, and managing a top secret spy headquarters. - Variety of rooms and activities, from decoding intercepted messages to providing medical support to wounded agents. - Story-based campaign that pits the player in the midst of a shadowy spy war. - Test your skills at building, upgrading, and running a successful safe house, providing support to spies, agents, and saboteurs. - You perform daily activities, such as decoding messages, interrogating enemies, aiding wounded spies. - Performing the activities earns you cash and agent XP. - Use this cash and XP to upgrade your Safe House further (unlocking new activities for greater cash yields) and levelling up your agents. - With your newly upgraded agents, you can send them out into the field, completing story missions and activities. Construct and upgrade your very own safe house. Create rooms to gain intel, interrogate prisoners, and manage your spies and soldiers. Upgrade your capabilities to unlock and complete various missions and assignments, working towards your ultimate goal of covertly overthrowing a violent dictatorship. 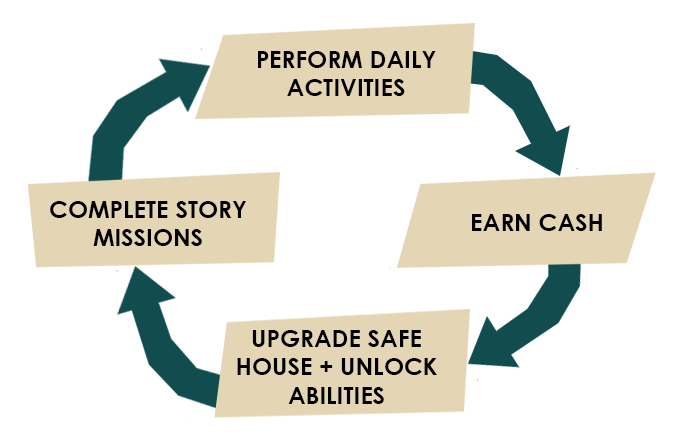 Perform the safe house's daily tasks to generate income and further the cause. Accept spies looking for shelter, receive supply drops, decode secret messages. Success will result in further success towards your mission, while failure may cost you your life.. Complete Safe House's rich main story by training and managing spies, soldiers, and saboteurs. Send them on missions and train them to be efficient masters of spycraft. But be warned, your decisions will have long lasting consequences, not just on your agents, but on the very political landscape in which you operate. Are you sure you know who you are working for? Like the game? feel free to back us on Kickstarter!